Menulog delivers for Catch Fish and Chips so you'll be able to track your courier on a map. Beef patty, lettuce, tomato, beetroot, onion and BBQ sauce. Beef patty, lettuce, tomato, cheese, onion and BBQ sauce. Beef patty, lettuce, tomato, beetroot, bacon, egg, pineapple, cheese and BBQ sauce. Panko crumbed chicken, lettuce, bacon, cheese, pineapple, piri piri and mayo. Bacon, double egg, cheese, onion and sauce. Minute steak, lettuce, tomato, beetroot, onion and BBQ sauce. 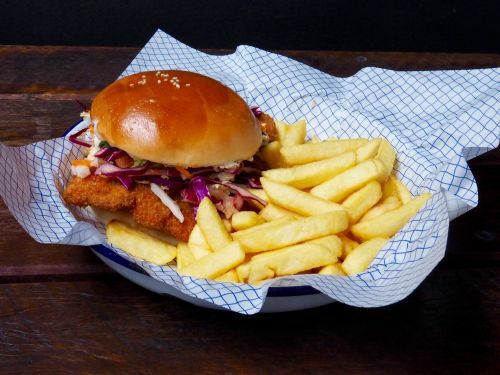 Crumbed fish with Asian slaw and housemade aioli. Grilled fish with lettuce, pickled cucumber and paprika tartare. Calamari salt and pepper style or grilled with salad or chips, tartare and lemon. One fish, two calamari, two prawn cutlets, two scallops, chips, tartare and lemon. Two fish, four calamari, four king prawns, four oysters, chips, lemon and tartare. Four fish, large chips, eight calamari, salad, tartare and lemon. Four fish cocktails or four calamari and chips.